Social-clinical psychologist Mogel concentrates on the hidden blessings of raising teenagers in this engaging follow-up to The Blessing of a Skinned Knee. 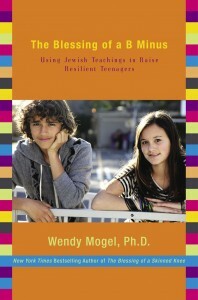 Intermingling wisdom and guidelines from Judaism and adolescent psychology, Mogel compares the teen years to the journey from Egypt to the Promised Land. As kids wander in the “desert” of adolescence, she advises parents to offer counsel and guidance, demonstrate empathy without entanglement, and resist the urge to intervene or rescue. In chapters peppered with true-to-life examples and humor, Mogel examines the blessings of a B minus, staying up late, hangovers, breaking the rules, and a variety of other teen topics, urging parents not just to look on the bright side, but to help kids benefit from the learning opportunities inherent in difficult situations.